the Ponte Vecchio wooden bridge (1209), also called Ponte degli Alpini or Ponte di Bassano, due to the soldiers song that you can watch on youtube (Sul Ponte di Bassano noi ci darem la mano ed un bacin d’amor. 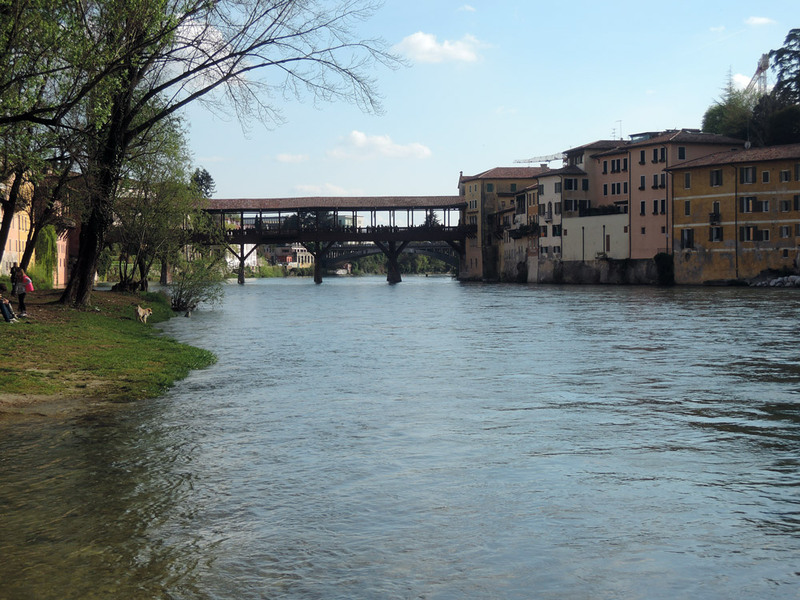 On the bridge of Bassano we will hold hands and we’ll share a kiss of love). The actual design is due to the famous architect Palladio (in 1569), even if it has been restored many times. 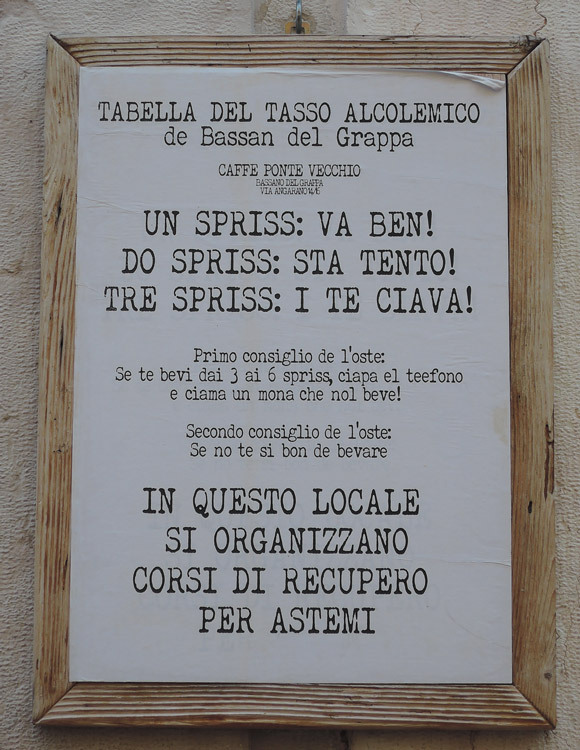 On the East side of the bridge you will find a ceramics shop and a grappa tiny café, while on the West side a grappa shop and the Alpines Museum. The bridge is 64 meters long, 8 meters large. 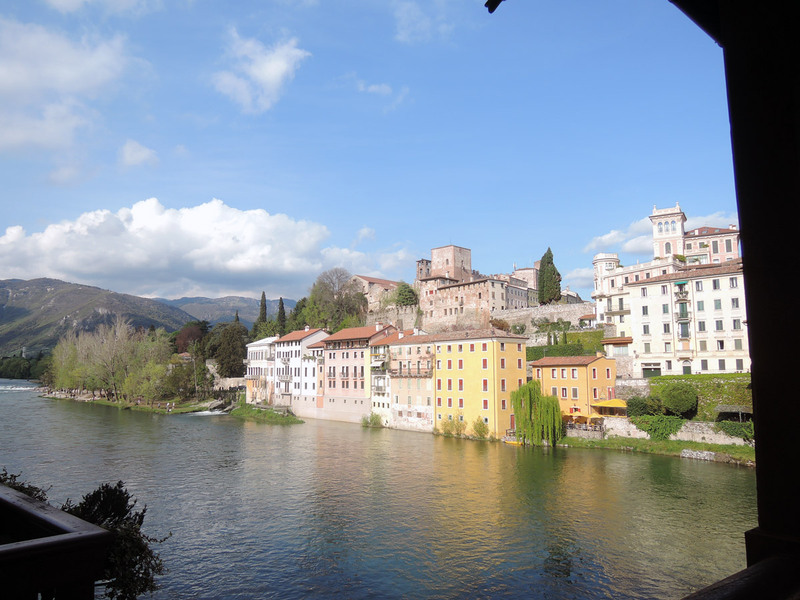 From the bridge you can enjoy a great view (river Brenta, town and mountains). We parked in a piazza (free parking) called Prato Santa Caterina, less than 10 minutes from the centre (walking distance). From the piazza you already can enjoy a superb view on the town. We headed directly towards the Ezzelino Tower and the Duomo, proudly standing on the right, but we could only admire both only from the outside (both closed). We continued our stroll toward a terrace in Piazza Terraglio, facing the bridge, so to take a picture (immediately shared on Instagram). Then we set out for the bridge itself. Mamma mia quanta gente! Oh, boy, how many people! (Later, in the afternoon even more!). It is not fair that only Monty Don can go in and out every garden he wants! We proceeded towards the Piazza della Libertà (meaning Freedom) with the Town Hall Loggia (the one with the beautiful clock), via Roma and Porta Dieda (with a Lion painted on the exterior side) and Piazza Garibaldi, where we stopped for lunch at the Danieli Café. We chose to eat al fresco. But the interior was also pleasant. Food was very good, service polite. The waiter and the waitresses were gentle and smiling. After lunch we visited the Civic Museum and then a very peculiar bookshop, la Libreria Palazzo Roberti, located in an aristocratic 1700s palace. Astounding. Each room is dedicated to a topic, and has its own supervisor. And the staff was super nice, letting me lurk here and there to take pictures, including the rear garden (thank you!) and the hall on the top floor (some local musicians were preparing their instruments for an exhibition – so I could also enjoy some music in the process). In the end we walked towards Porta delle Grazie. Under the door you can see the Caffé Italia, where once also George Sand stopped. Now it is sadly closed so that we couldn’t see the interior. And now begins the touching part of the day. Just passed Porta dell Grazie, begins il Viale dei Martiri, Martyrs Avenue. There you will see a series of trees. Each displaying a little flower vase, a date and sometimes a photo. These are a few of the young boys died during the II world war. There is also a panel, explaining the 1944 Massacre: September 1944. German and Fascist troops surrounded the Grappa mountain, in order to round up the partisans hiding there. Many of them were captured and killed but many others managed to escape, founding a new hiding place. That’s when the Germans announced that they would have granted pardon to everyone who would have presented spontaneously. The population was relieved. Parents and relatives accompanied the boys to the German Command. But it was a trap. Hundreds of young men were executed or sent to concentration camps. The worst day was September 26th, when 17 men were shooted and 31 partisans were hanged from Bassano’s trees. So, what did I tell you about the discrimination against non drinkers in my region? the perfect combination between a lively town and a quiet village, or at least it was on Sunday!